For dental patients that want a better dental experience, or fears going to the dentist. that want to provide a better dental experience. with an interest in dental anxiety management. Local anesthesia, anti-anxiety medications, and conscious sedation are all available to help anxious patients deal with the dental procedures they are having done, yet a set of DentiSign hand signals that can indicate clearly to a dentist when a patient needs to take a break from a painful or uncomfortable procedure. Though it seems so incredibly simple, DentiSign gives patients greater control (real and perceived) over their procedure alleviating much of their dental anxiety. 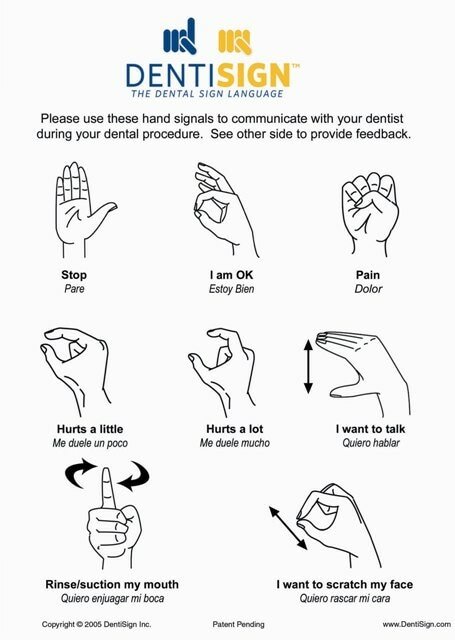 After being adopted in the US several years ago, patients globally are now enjoying the benefits of using DentiSign dental sign language to express their needs/anxiety to their dentist. ​More control means less pain and discomfort-and more patient satisfaction.